Jeff Sugg ’95 (below) with designs he created this spring for The Last Five Years. His work “stretches my brain in a lot of different directions,” he says. Photo by Laurence Kesterson. 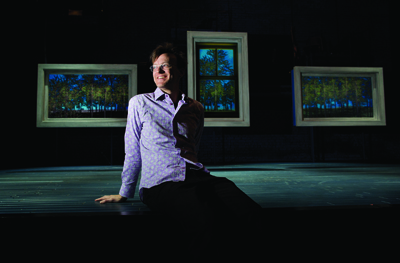 It’s mid-April, and Jeff Sugg ’95 is hunkered down in Houston, prepping the projection design that he will integrate into the live stage revival of The Elephant Man at the acclaimed Alley Theatre. “It’s an interesting take on the show—very industrial, with an almost carnival feel to it,” he says. The visual effects he’s created mimic “the early optics of turn-of-the-century image technology,” such as magic lanterns. That aesthetic fits with the style Sugg has developed in his nearly 20 years as a projection designer for stage productions—most notably four Broadway shows. He describes his style as “organic, homemade, DIY. A lot of it goes back to my fascination with 19th-century technology. I try to make animations look like they are being projected through a zoetrope. It’s very Muybridge,” he says referring to the man who pioneered stop-action photography. The day after The Elephant Man opened in Texas, Sugg was back home in Brooklyn and commuting via subway to Manhattan’s Theater District, where he began painstakingly crafting projected images for The Last Five Years at Second Stage Theater. Pointing to the landscapes he created as a backdrop for one of the show’s three songs, he says, “There’s a little of a lot in there.” The fine-art–looking images with their watercolor-like brushstrokes are reminiscent of Van Gogh and Ben Shahn. For his projections, Sugg often photographs images—actual clouds and trees—before manipulating them through a computer program. In contrast, his young assistants will go straight to Google and find images, then alter them in Photoshop. Sugg found his calling at Swarthmore his junior year, “pretty late in the game,” he concedes, having entered as a biochemistry major bound for medical school. He carried his interest in “visually driven theater” from Swarthmore to San Francisco with the encouragement of Allen Kuharski, chair of theater, and visiting professor Sue Ellen Case. After a residency with the San Francisco Mime Troupe, he moved back East to work with the experimental Wooster Group in New York, eventually as technical director. Simultaneously, he helped found Pig Iron, the Philadelphia theater company that is still doing groundbreaking collaborative work. In 2005, as Sugg was building a solo career—“I designed for every random hole in the wall I could find”—he pioneered Swarthmore’s first integrated media design course, traveling from New York City once a week. In the last few years, his gifts have been fully revealed. In 2012 Sugg designed two Broadway productions: the Tony-nominated Bring It On: The Musical and Magic/Bird. His other two Broadway productions, Chinglish and 33 Variations, ran in 2011 and 2009. He’s been working on Prince of Broadway, a musical retrospective of the career of the legendary producer and director Harold Prince, scheduled to open in Japan in 2015, and the courtroom drama A Time to Kill, to open in October.